To make this train cake, I used 3 cake mixes and a long loaf pan, small loaf pans and a tube pan. The tube pan was in the shape of a heart. I made 3 long loaves and the tube for the engine. I cut the cakes to the shape I wanted. The tube cake was for the top of the engine, that looks rounded. The smoke stack was an ice cream CONE and I filled it with icing and put small marshmallows on top and added the rock candy sucker in the center as smoke. All the trim on the engine was candy buttons, Air Heads sour belts, oreo cookies for wheels and the #3 was a Nerd's rope. The cars were small loaf pans. One car carries cars, another has 'coal' , which is chocolate chips, another car hauls 'logs', which is big pretzels. Another car has 'animals', which is animal crackers. Next there is a small 'tanker' and lastly is the caboose. These are all done in buttercream and some have candy trim. Another candy I used was pull apart Twizzlers. This is one cool cake. I can only hope to attempt it. looks fantastic! you did such a good job! Kelly you are absolutely amazing!! 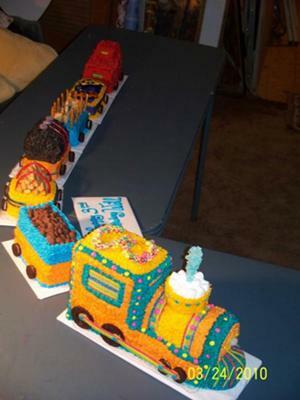 I love the train cake!! That is awesome!!! Great job!! Kelly you are one talented woman and it seems your creativity never ends. You always amaze me with your creations. Keep up the good work. I would love to meet so many people on here!!!!! What wonderful original talent you have and I think you are absolutely amazing! Keep enjoying your creativeness. Would love to have you close enough to enjoy your cakes in person. Hope someday I will be able to meet you in person with Delores. Nancy, I'm not entering anything. I've told you before that I get told all the time that what I do is not good....I do it for fun, just like you! Join in and write your own page! It's easy to do. How? Simply click here to return to Train Birthday Cakes.